The 8 Gal. Portable Oil Free Electric Air Compressor is ideal for completing a multitude of household inflation jobs, such as bike tires, car tires, sports balls, pool toys and air mattresses. It efficiently handles brad and finish nailers for trim/finish jobs, arts and crafts projects and household repairs without a hassle. The compressor is equipped with rubber wheels which make it easily moved around your garage or job site. The DEWALT DWFP55126 22.7 L Air Compressor is designed with a high efficiency motor for easy start up in cold weather or extension cord applications. This compressor has 2 universal couplers to easily support 2 users. The DWFP55126 features a long life oil-free pump for maintenance-free operation. General air compressors are built to withstand the rigors of the home, farm, and job-site. The AC1212 Quiet two-Gallon Oil-FREE Air Compressor is a compact tool that's easy to store and move. Additionally, a user-friendly control panel allows for simple operation, an oil-free pump means less spills and mess. Universal motor & pump tested to run over 200+ hours and 50/50 Duty cycle (on/off). It's heavy duty 4 rubber feet ensures stability and portability and the one-piece manifold design makes the compressor durable enough for the toughest jobsites. This AC1212 with built-in auto rewind hose reel is Ideal for dusting, inflating car & bike tires, air brushing, upholstery, cleaning work areas and stapling finish nailing. Contractor grade compressors can be utilized for a myriad of purposes, but are primarily engineered to power nail-guns. 8G Hotdog Air Compressor 150 Psi The 8 Gal. Portable Oil Free Electric Air Compressor is ideal for completing a multitude of household inflation jobs, such as bike tires, car tires, sports balls, pool toys and air mattresses. It efficiently handles brad and finish nailers for trim/finish jobs, arts and crafts projects and household repairs without a hassle. 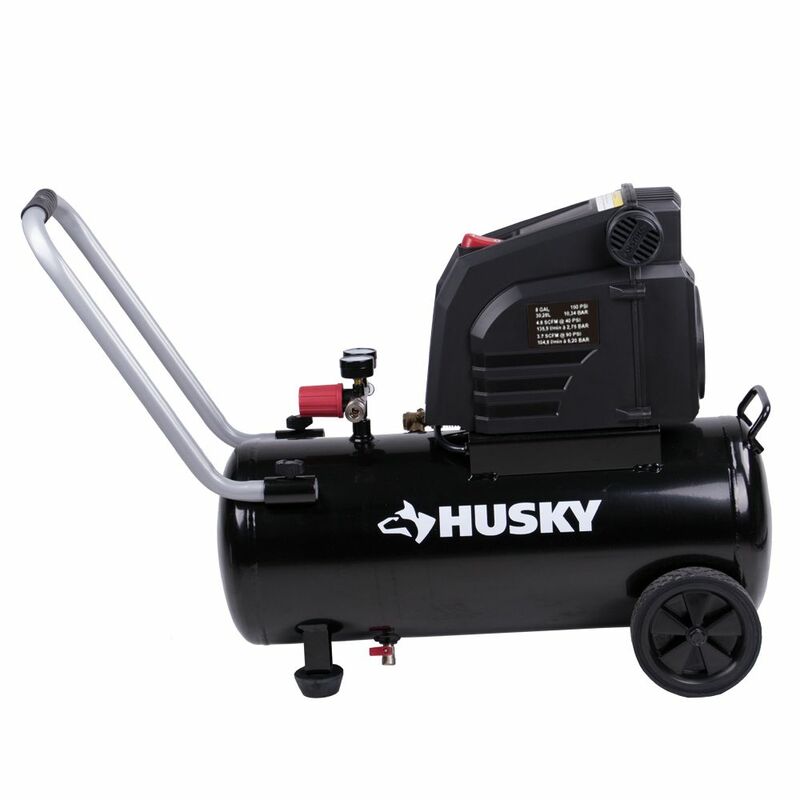 The compressor is equipped with rubber wheels which make it easily moved around your garage or job site.